In the Toro DO there are currently 8,000 ha of land planted with vines with a portion sourced to Vintae, the La Rioja wine company launched by José Miguel Arambarri and sons José Miguel and Ricardo. The produce wine from 15 DOs and in 2006 ventured into Toro. Three years later they introduced the Matsu brand. In Japanese the brand name translates to "wait" and is a tribute to the workers who tend the vines over multiple generations. As proof, each wine label includes a photo of a viticulturist spanning these generations. I recently received samples of three of these 100% Tinta de Toro wines sourced from extremely old vines farmed using biodynamic techniques. 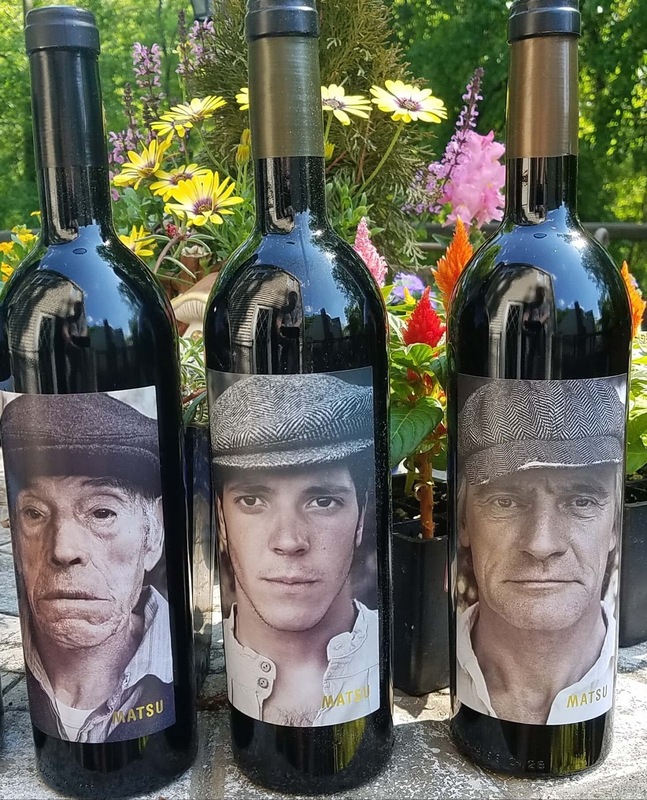 Matsu El Picaro 2016 ($13.99) - consists of grapes harvested from a selection of 50 to 70 year old vines. The juice is fermented and rests three months on lees in concrete vats and undergoes malolatic fermentation in French oak barrels. This Roble wine is fresh yet full bodied with a velvety texture, dark juicy fruit, and lasting tannins. A great tasting wine. Matsu El Recio 2015 ($21.99) - consists of grapes harvested from a selection of 90 to 100 year old vines. After fermentation in concrete vats the wine was aged 14 months in French oak. This Crianza is intense that is both chalky and chewy; dusty and leathery. The dark fruit and chocolate lingers with the tannins. Ups their game here. Matsu El Viejo 2015 ($46.99) - consists of grapes harvested from a vines over 100 years old. It follows a similar fermentation and aging regime as the El Racio but extended to 16 months. This Reserva is even more intense exploding in the palate with a combination of fruit, spice, and toasted wood. Chewy tannins integrate with the juicy acids to keep the party going. Oh yes, if only in my budget. Hidden Asset refers to a wine, a red blend to be specific, that Lucas & Lewellen Estate Vineyards produces to honor their estate vineyards in Santa Barbara County - for this vintage the Los Alamos Vineyard and Valley View Vineyard. 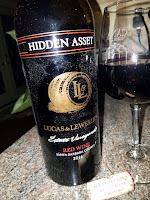 The actual "Hidden Assets" are the grape varieties used in this unique blend, a kitchen sink of Malbec, Merlot, Syrah, Petite Sirah, and Cabernet Franc. The percentages of each grape variety and vineyard source is proprietary information but the winery prints the percentages sourced from the four vineyard sites. Three ranches in the Los Alamos Vineyard account for 95% of the grapes as this area south of the town of Los Alamos along Highway 101 is home to over twenty grape varieties. And some of the vines are from cuttings brought over from Europe over 25 years ago. This region benefits from a "rare transverse mountain range topography, an east-west orientation which channels the cool ocean air of the Pacific into the coastal valleys, allowing warm days and cool nights to produce a long, gentle growing season". The same holds true for the Valley View Vineyard in the Santa Ynez Valley which rounds out the remaining 5%. Primarily known for its Cabernet Sauvignon, blocks in this vineyard are planted with other Bordeaux varieties as well as Syrah. 2016 Santa Barbara Hidden Asset Red Wine ($29) - This is a delicious wine that remains vibrant over three days of tasting. It starts with spice and pepper, then leads to a strong cherry and raspberry profile, with spices returning for the long and moderately tannic finish. Nicely done and at a decent price point. Cheers. 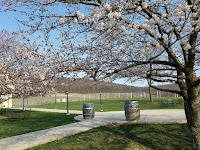 Breaux Vineyards opened in 1997 when it was only the fifth winery in Loudoun County and the 50th in Virginia. 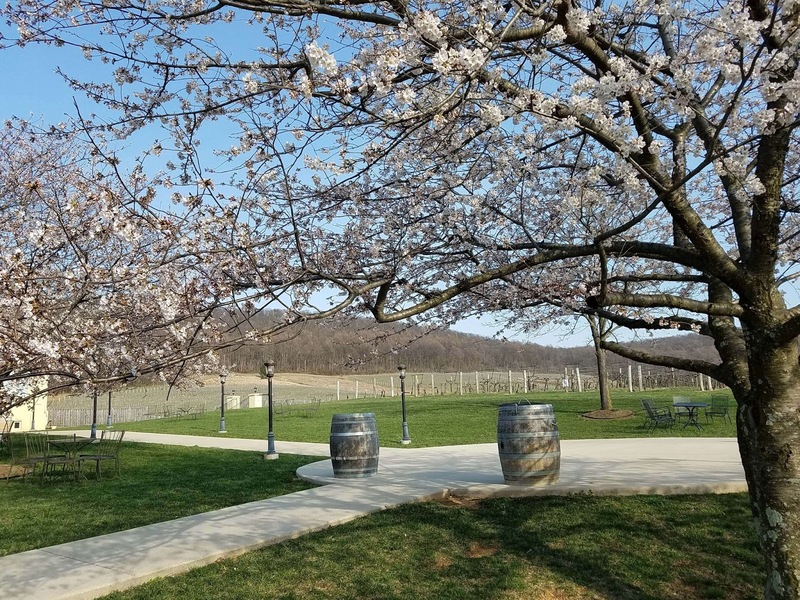 Today Breaux is one of the largest of the 43 wineries in Loudoun and statewide (270 wineries) and its success can be attributed to several factors -- starting with their location at the western foothills of the Blue Ridge and Short Hill Mountains. The 104-acre estate benefits from plenty of sunshine from late morning to sunset and consistent breezes that help alleviate mildew. 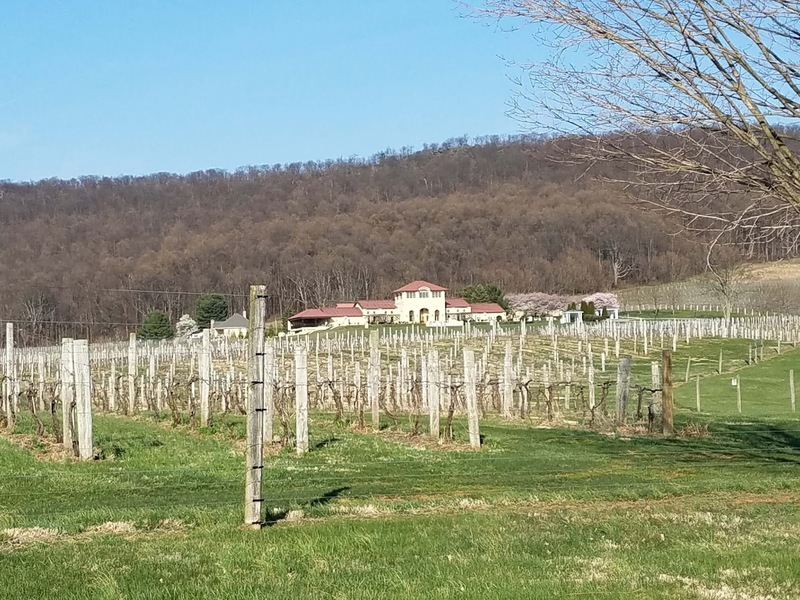 The second factor occurred when founder Paul Breaux and original winemaker Dave Collins (owner of Maryland's Big Cork Vineyards) not only heavily invested in new state-of-the-art wine making equipment but also planted a pioneering set of vinifera grapes. These grapes include the standard Bordeaux varieties but also Virginia's signature grape Viognier and Nebbiolo. 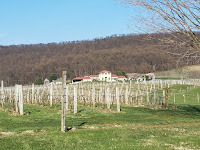 In fact, to this day Breaux is still only the third winery in the state to plant this Italian grape (known as The King of Wine) and it has become the winery's signature wine. Third, Vice President Jennifer Breaux and her team are skilled marketers, active on social media and hosting multiple events including the annual Cajun and Key West festivals. To illustrate how savvy Jennifer is once I tweeted that I was heading out to Loudoun and Jennifer replied quickly to stop in for a free tasting. Invitation accepted. 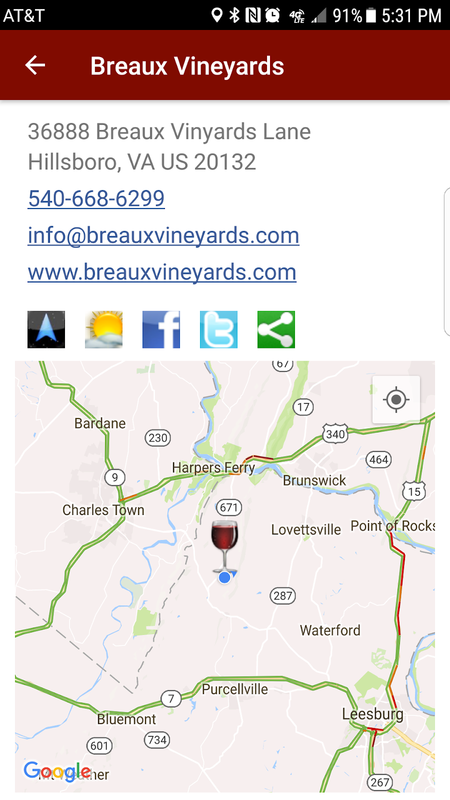 Finally, and most importantly, Breaux Vineyards has succeeded over the last 21 years because they produce quality estate wines in each successive vintage. That was on display when I visited recently to discover a huge, renovated tasting room with abundant inside seating to handle the summer humidity. There is still plenty of space outside for dogs, children, and picnicking with outside food. 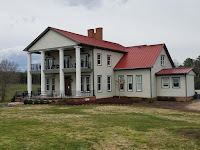 Tours of the new facility are available weekends for $5 and the tasting fee is $15 for half a dozen wines. The charitably staff member also poured me their 2012 Nebbiolo ($59) as I had mentioned that I was unable to attend a special vertical tasting event the next day. This wine was for sale only because the winery had discovered several cases hidden during the recent renovation and the bottle aging had tamed some of the tannins and acids. But not all. There's still plenty of chewy texture and tannins to accompany the dark plum characters and fresh acidic finish. This showcases why Breaux = Nebbiolo. Here is a quick rundown of the remaining wines in the general tasting. Cheers. 2016 Sauvignon Blanc ($25) - Light and refreshing with more grapefruit than lemongrass. 2016 Viognier ($28) - 10% was aged in neutral French oak with another 5% in large Acacia Puncheon barrels providing additional depth to the traditional tropical and stone fruit flavors. 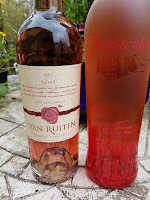 2016 Rosé ($24) - A blend of five Bordeaux grape varieties, obtaining color from two hours of skin contact, and providing a refreshing strawberry and melon flavors. The wine for dinner that evening. Equation Red ($20) - Another blend; this a kitchen sink of Merlot, Petit Verdot, both Cabs, Chambourcin, and Malbec; is a juicy fruit forward easy drinking wine in-spite of or because of 18 months aging in American and French oak. The approachable tannins made this a clear second course for dinner. 2012 Cabernet Sauvignon ($42) - A second wine bottle aged in addition to 18 months in American and French oak this wine is excellent - texture, fresh juice, hints of chocolate, but just a tad pricey for our budget. 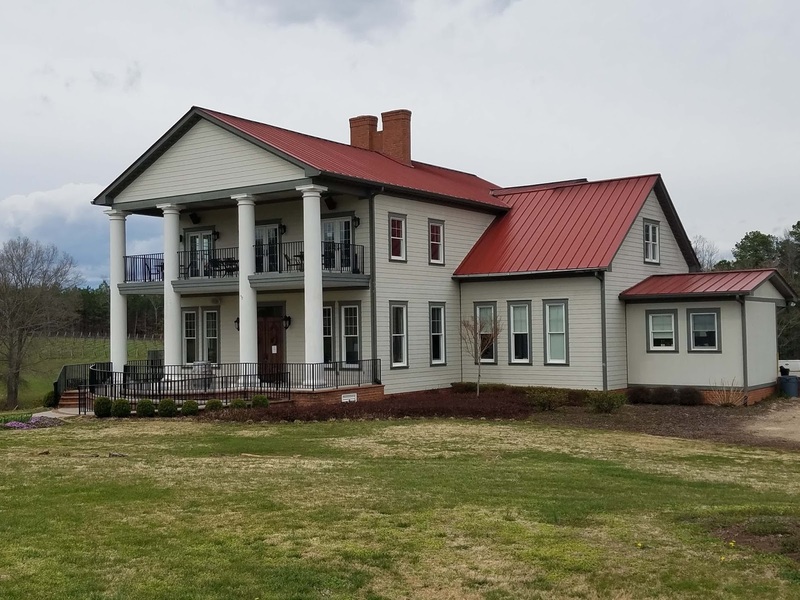 2013 Meritage ($43) - Another higher priced wine with a pedigree of being in the 2016 Virginia Governor's Cup Case Club. This blend of Merlot, Cabernet Sauvignon, Petite Verdot, Cabernet Franc, and Malbec showcases structure and integrated tannins, yet I preferred the varietal Cabernet Sauvignon more because of its edginess. 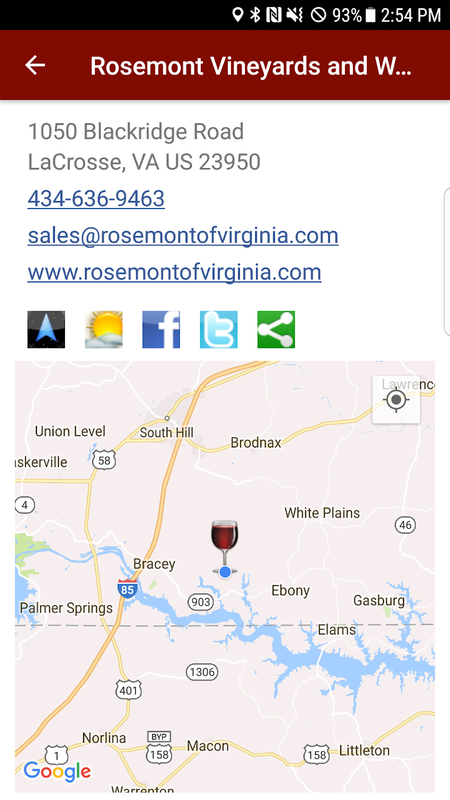 Located in a remote area of the Commonwealth, Rosemont Vineyards and Winery is relatively disadvantaged when selling their wine. 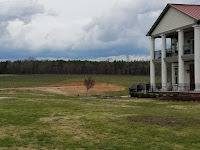 It is the sole craft beverage producer situated in southeastern Virginia along I-85 -- which runs from I-95 south of Richmond-St. Petersburg to the Raleigh-Durham triangle. Since they cannot leverage an existing wine or craft beverage trail to attract consumer traffic, they must attract customers through the quality of their portfolio. 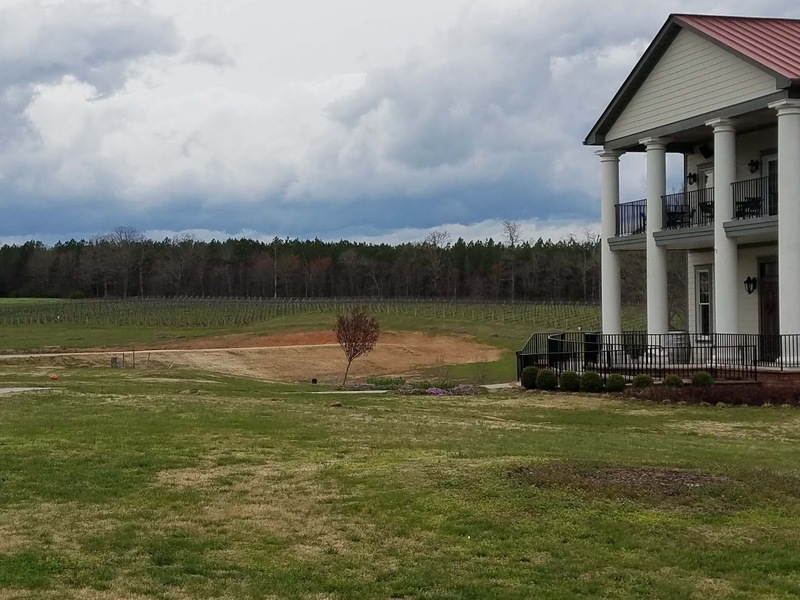 That is what enticed us to visit the winery as well as most other visitors who travel from Richmond, Raleigh, and nearby Lake Gaston. The 450 acre Rosemont Estate has been a working farm ever since the Rose family purchased the property in 1858. In 2003 Stephen Rose, along with his wife Chandra, returned home and planted 22 acres worth of grapevines. And in 2007 they produced their first wines using an underground and modern gravity-flow wine production facility. Their son Justin volunteered to assume the winemaker position and "subsequently enrolled at Napa Valley College to study viticulture and oenology, while interning at O’Shaughnessy Winery and Capiaux Cellars." Since their first release, the vineyard continues to expand as the winery maintains releasing only estate wines. 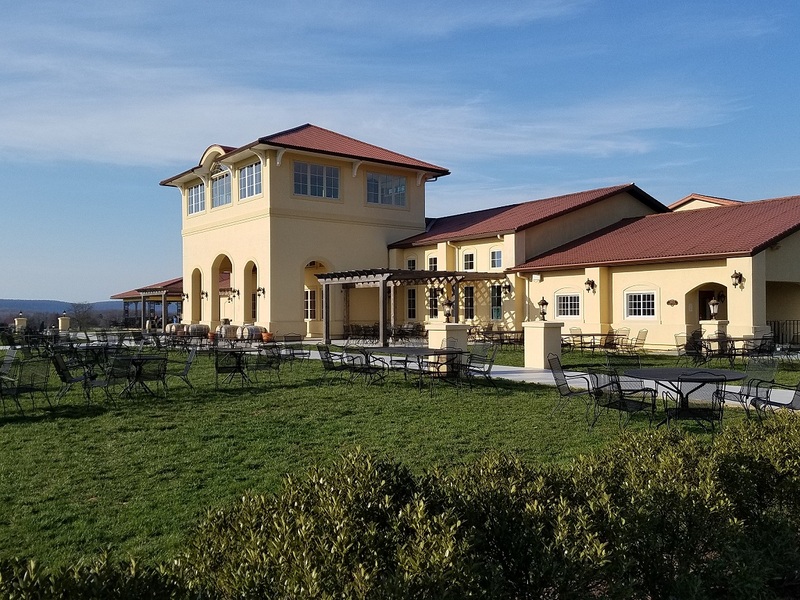 Upon arriving at the winery, their large tasting facility is partly enclosed by newly planted vines and a large picnic area suitable for dogs and children. Inside there are also spacious accommodations both at the tasting bar and at various tables to enjoy a sip at your leisure. 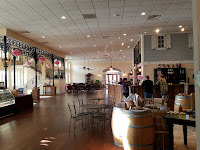 Tasting fees are $10.00 per person which amounted to 11 wines during our visit, with each wine reasonably priced. Traminette 2016 ($16.95) - the grape is a cross of the French American hybrid Joannes Seyve 23.416 and Gewürztraminer with the intention to produce the distinct varietal character of its vinifera parent. And this dry wine lives up to that reputation. It possesses the floral aromatics of Gewürztraminer as well as it's distinct spicy character. The winery recommends serving with spicy foods or oysters. Virginia White ($14.95) - is a bright, dry wine blend of Vidal Blanc, Chardonel and Traminette. There is abundant stone fruit and citrus character throughout - from the nose to the tail - creating a refreshing summer sipper. Pinot Grigio 2017 ($18.95) - in 2016 Rosemont lost 88% of their Pinot Grigio crop to frost and as a result experimented by barrel fermented the harvested fruit. That process was well received so they continued into 2017 with a portion of the grapes fermented in barrel. This results in a wine with more body than anticipated while retaining the refreshing green apple and acidity character. One of our favorite wines. Rosé 2017 ($18.95) - produced from lightly pressed Chambourcin grapes that combines both strawberry and tart cherry with refreshing acidity. This wine is what attracted us to visit and we were not disappointed. Virginia Red ($15.95) - is a medium bodied blend of Cabernet Franc, Cabernet Sauvignon, Chambourcin and Syrah. This is an easy sipper - perhaps an entry point into red wine - with hints of oak and tobacco that melds with the cherry profile. Syrah 2015 ($19.95) - this is a medium bodied wine that still packs plenty of fruit alongside the grape's spicy character. Although it spent 16 months in oak before bottling it is not overdone as the vanilla easily mingles with the spice and fruit. Merlot 2015 ($20.95) - an estate favorite as Rosemont believes their Merlot "shows the best of our terroir" and it was the wine we opened at the hotel that night. It is a delicious wine, plenty of berry fruit with hints of chocolate and baking spices. The winery suggests pairing with rustic Italian, hard cheeses, and steak; but we preferred solo surrounding a fire pit. Cabernet Franc 2015 ($22.95) - this was once considered Virginia's unofficial signature grape as its relatively thick skins and loose clusters handle the region's high humidity. This release includes 12% Merlot which softens the wine's prolific profile. This wine would still benefit with aging to soften the remaining rich tannin structure and spicy and nutty characters. We have a couple that hit the cellar on our return. Kilravock 2015 ($32.95) - is a Meritage blend of 40% Merlot, 36% Cabernet Franc, and 24% Petit Verdot and named from the Scottish castle where the Rose family traces their ancestry. This is an excellent wine, our favorite of the reds, with a structured backbone, leather and tobacco, and a little vanilla to soften the finish. The tannins and finish are also very approachable. Nicely done. Lake Country Sunset ($12.50) - the first sweet wine in the portfolio is made from a blend of early and late harvest Vidal Blanc. It is sweet, but the grape's acidity counters the sugar allowing the citrus and stone fruit to shine through. At this price, it's worth opening at dock side. Blackridge Red ($12.50) - made from 100% Chambourcin, this wine is sweet and jammy. Although well made, for my palate, the acids do not compensate enough for the high sugar profile. But residents of the area seem to disagree. Galicia is located in the northwest corner of Spain and is home to Rías Baixas Albariño wine. 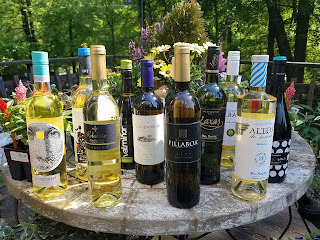 DO Rías Baixas was created in 1980, but when Spain joined the EU in 1986 the DO was changed to simply Rías Baixas as EU laws did not recognize a DO named for a single grape variety. In order to be labeled Rías Baixas the wine must comprise at least 70% Albariño. The denomination also permits six other types of wines which includes the Rías Baixas Albariño - 100% Albariño from any sub-region. There are five of these sub-regions. Ribeira do Ulla is the newest (formed in 2000) and is the most northern region. Val do Salnés is known as the birthplace of the Albariño grape. This is the original and oldest sub-region and it's fingers reach out into the Atlantic. Soutomaior is the smallest of the sub-regions where the soil is light and sandy over granite bedrock. Condado do Tea (The County of Tea) is named after the river Tea, a tributary of the Miño River which separates the border with Portugal, and is the warmest and driest region. O Rosal also resides against the Miño River -- adjacent to the Atlantic. Wednesday May 16th Rías Baixas Wine partnered with Snooth to market the region through an Access Albariño Virtual Tasting featuring eleven Albariño wines. 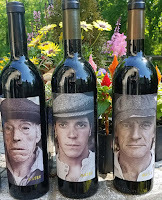 Snooth is offering 3, 6, and 9 packs of theses wines at a special sale by clicking here (excluding Paco & Lola and Terras Gauda): https://www.snooth.com/offers/access-albarino-taste-pack-4/. As a participant here our my notes for the tasting - and as usual for the region - all the wines recommended for value and quality. Unless otherwise stated all are 100% Albariño. Pazo Señorans Val do Salnés ($25) creamy tropical fruit and lemons, less saline - but depth and dependable acids. Terras Gauda O Rosal ($24) is a unique blend of 70% Slbariño, 15% Caiño, 15% Loureiro providing depth and citrus & stone fruit, plus minerals. Excellent. In July 1993 the Oakville and Rutherford AVA's were carved out of the central Napa Valley AVA in order to accentuate their specific micro-climates best suited for Bordeaux varieties. Both areas contained well drained gravely soils and moderately warm with each region influenced by early morning fog and afternoon breezes (with Rutherford warmer, lower in elevation, and less affected by wind and fog). Whereas Cabernet Sauvignon is the principle crop in both AVAs, each also shares an affinity for Sauvignon Blanc. The same is true with the Chiles Valley AVA, another sub-AVA in northeastern Napa Valley. This AVA is located in the Vaca Mountains and has a cooler climate than the majority of Napa Valley due to its higher elevations and a cooling breeze from the Pacific Ocean. 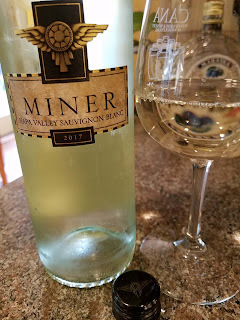 Miner Family Wines encompasses these three AVAs with their 2017 Napa Valley Sauvignon Blanc ($22) where 40% comes from Rutherford's Shartsis Vineyard, 52% from Chiles Valley Sage Creek Vineyard, and 8% from Oakville's Crossroads Vineyard. It is an excellent wine, lemon but not New Zealand grassy, more Bordeaux with texture and depth, finishing with refreshing acids. E5 – Spanish Red Wine ($19.99) is a blend of Grenache/Garnacha, Tempranillo, Monastrell, and Carignan/Cariñena grapes with Mediterranean and Continental inﬂuences and sourced from ﬁve primary regions: Priorat, Jumilla, Toro, Rioja, and Ribera del Duero. They targeted old vines with low yields that produced a rustic wine with complexity, juicy tannins, and solid acids. My favorite of the group. F5 – French Red Wine ($19.99) is a blend Grenache, Syrah, and assorted Bordeaux varietals from Rhone, Roussillon, and Bordeaux. One again old vine blocks were targeted that helped create another rustic wine with even more juicy tannins and dirt covered cherries. This is an old world wine. NZ7 – New Zealand Sauvignon Blanc ($19.99) is the second release from the Land of the Long White Cloud and targets Marlborough growers that have been farming since before this area was recognized as a premier wine growing region in the 1970’s. 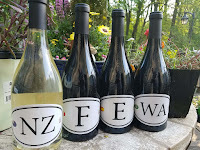 The wine includes tropical and lemon grass characters from fruit sourced from the Wairau Valley as well as minerality and balance from the Awatere Valley and Waihopai. This is a solid New Zealand styled Sauvignon Blanc, refreshing with plenty of complexity. WA5 – Washington Red Wine ($19.99) is a blend of Syrah, Merlot, and Petit Sirah aged 10 months in French and American oak. 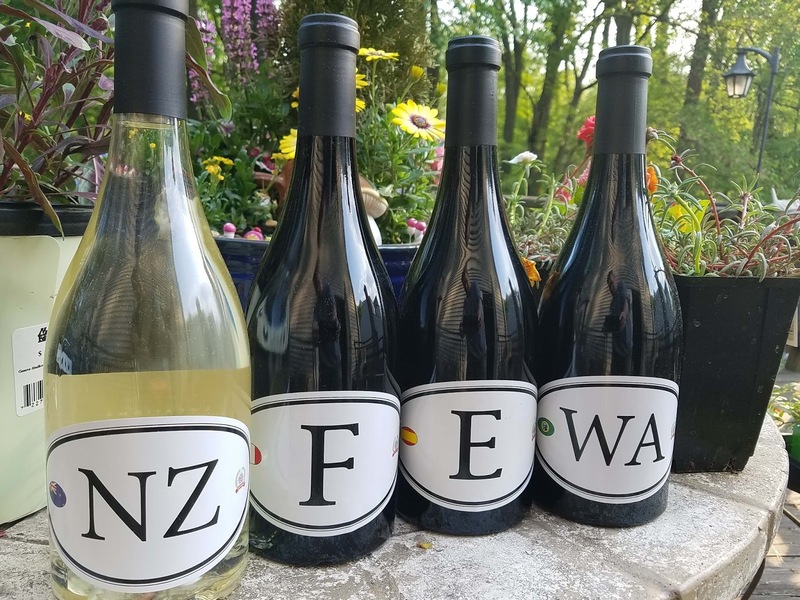 The wine was sourced from diverse lots in the Evergreen State's greatest appellations: Walla Walla, Woodenville, Yakima Valley, and more. The wine is new world and medium-bodied with fruit forward dark fruit, various spices, chocolate, and easy tannins. 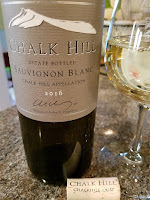 The Chalk Hill AVA is one of Sonoma County's 13 appellations and was carved out of the northeast corner of the Russian River Valley AVA in 1983. It is distinguished from its neighbors - the cooler Russian River Valley to the west and the warmer Alexander Valley to the northeast - by its higher elevation and chalky white ash that characterizes the soils and its name. This is also the name of Chalk Hill Estate Vineyards & Winery, The estate is one of only four wineries in the AVA and is a collection of 60 different small vineyards - each growing a diverse set of grapes from Chardonnay, white and red Bordeaux, Viognier, Syrah, Sangiovese, Zinfandel and even Pinot Noir. 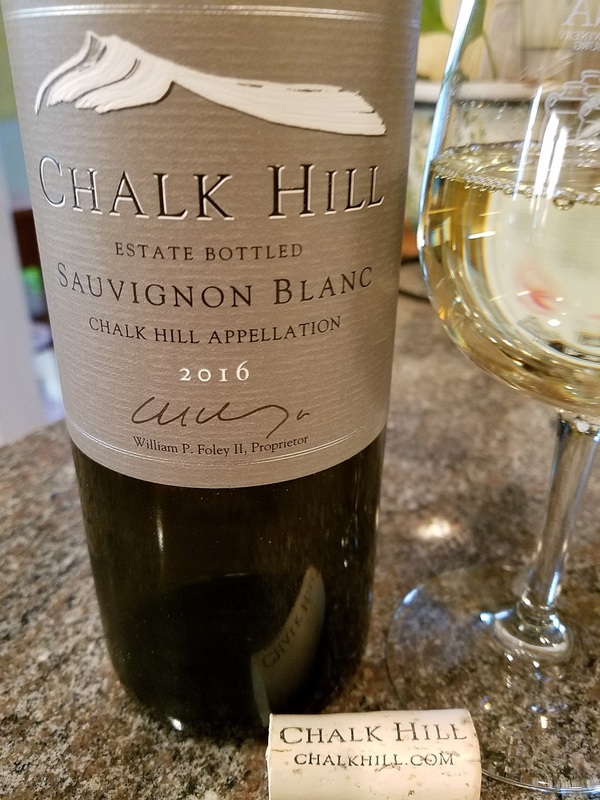 I recently received a sample of one of the wines made from these grapes: Chalk Hill 2016 Estate Sauvignon Blanc ($33). Bluntly, this wine is fantastic, a much different Sauvignon Blanc from NZ as its powerful with a strong lemon-pineapple profile combined with depth and texture, finishing with refreshing acids. Highly recommended. Lodi California is perhaps America's most diverse wine region - Paso Robles may object - but any region that grows over 125 varieties is quite diverse. And Lodi rosé wines reflect this diversity with Carignan, Grenache, Barbera, Pinot Noir, Tempranillo, Syrah, Mourvèdre, Cabernet Sauvignon, Petite Sirah and Zinfandel used in various blends. This Mother’s Day (May 13th) the Lodi Winegrape Commission and its members are planning multiple Mother’s Day weekend (May 12-13) events. 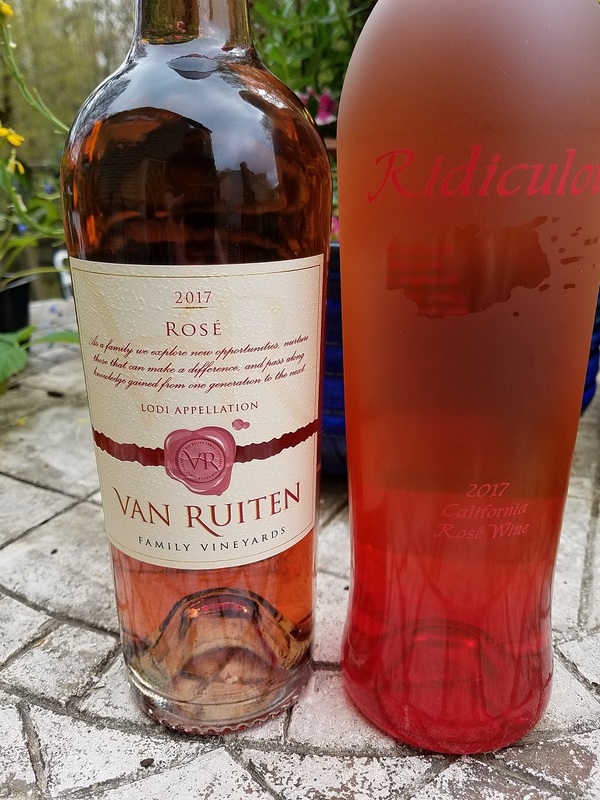 That organization sent us two wines to help spread the word starting with the Van Ruiten Family Winery 2017 Rosé ($12). This is a saignée wine meaning that it's the bleed-off of red grape juice to make the red wine more concentrated. For many wineries it is a profitable bi-product. The blend itself is anonymous but the wine is very good; powerful fruit, flavorful, and refreshing acidity. A great deal. The second wine was the Macchia Wines Ridiculous California Rosé 2017 ($25) another anonymous blend of Spanish and Italian varietals. This wine is lighter and a little flimsy, yet contains refreshing acidity. Rosé doesn't need to be restricted to Mother's Day but that weekend can start pink. Cheers. 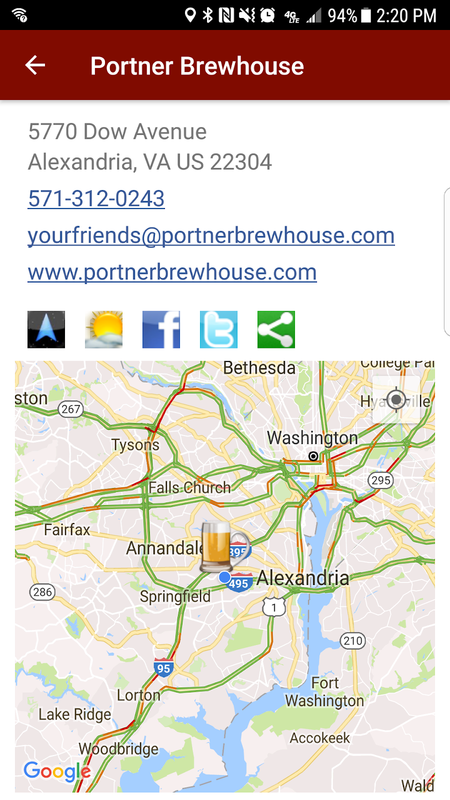 In 1867, there were 3,700 breweries operating in America and one of those was Alexandria based The Robert Portner Brewing Company. The brewery had opened that year and later would become one of the largest producers in the southeast. And Its flagship TIVOLI Hofbrau Pilsner (TIVOLI is I LOV IT spelled backwards) would eventually be distributed from Washington D.C. to Florida using refrigerated rail cars and using the city's popular railroad network. Portner was also a successful inventor and he patented a system for chilling lager as well as an ice-making machine; both were utilized to produce lagers year round and to refrigerate the rail cars. In fact these two systems were used to create a cooling system in his house -- perhaps the first air conditioned home in America. In 1879 Portner was honored by being elected the first President of the United States Brewers Association , the precursor to today’s Brewers Association. However, by the time of Federal prohibition in 1919, so many states had enacted their own prohibition regulations that there were only 1,000 breweries affected by the Federal ban. 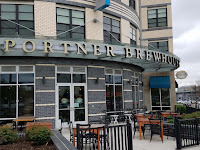 The Robert Portner Brewing Company had closed three years previously when Virginia had enacted their own prohibition ban . 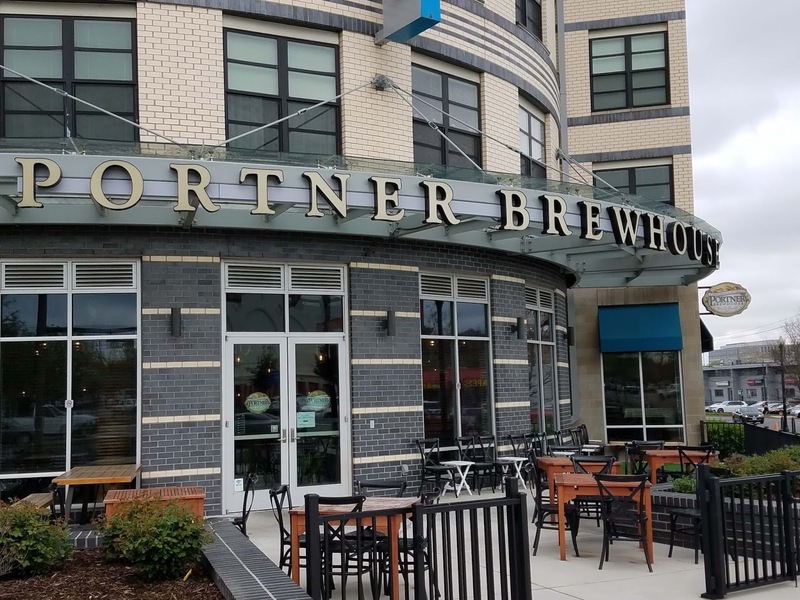 A hundred years later, two of Robert Portner's great-great grandchildren, Catherine & Margaret Portner revived the family legacy by opening Portner Brewhouse -- not too far from its original location. 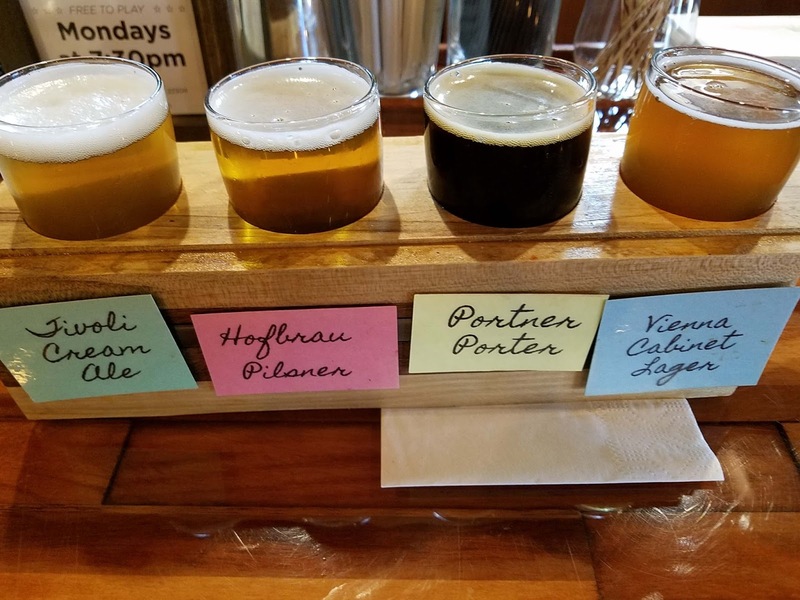 They recreated a few Pre-Prohibition recipes, including the Hofbrau Pilsner, in their ever day series augmenting that with a few more modern and popular styles. This pilsner is brewed with malted barley, corn, rice, and Cluster hops which is a historical variety grown in New York State when the Empire State was the capital of American hops production. The Tivoli Cream Ale is a beer style that attempts to mimic the pilsner flavor with the speed of ale brewing and this is very similar to the Hofbrau. My two favorites. The Vienna Cabinet Lager is another reconstructed recipe and is not as sweet as most modern Vienna lagers. And the Portner Porter comes across dry with roasted malts and mocha. Both nicely done. The remaining beers offered during our visit were original recipes from head brewer, Greg Maddrey. The Nor'Wester IPA was a refreshing and balanced alternative to the overly hopped IPA market. The First Bloom Blonde and Saint Asaph's Tripel were solid interpretations on these Belgium beer styles and the Spite House Stout was a very delicious chocolate and roasty English stout. And as always, theCompass Craft Beverage Finder will guide you through your #VABreweryChallenge. Cheers.